Nineteenth century illustration of bronze religious objects from the Bay of Naples. 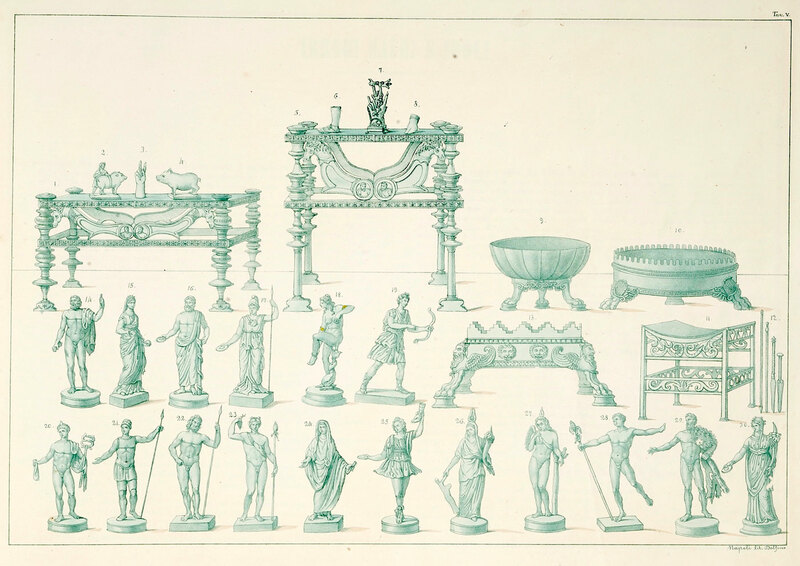 Please note the Hand of Sabazius (7), the Lar statuette (25), the Hercules statuette (29) and the Harpokrates-Cupid statuette (27). Ceci, Carlo. 1854. Piccolo Bronzi del Real Museo Borbonico: Distinti per Categorie in Dieci Tavole, Descriti e Disegnati. Naples: Stamperia di Salvatore Piscopo, Museo Nazionale di Napoli. Plate V. Image courtesy of Special Collections, The Sheridan Libraries, Johns Hopkins University. These small bronze statuettes shed light on Roman religious practices in the private sphere. 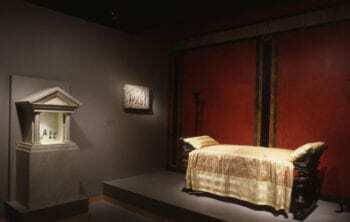 Most Roman households featured a niche or altar designed for private worship, called the lararium. Often located in the atrium or near the kitchen hearth, the design of the lararium evoked the architecture of public temples in miniature. Families would arrange religious statuettes, such as the ones included in this exhibit, within lararia. The intimate scale and setting of these domestic religious shrines made the daily worship of deities more tactile and personal. This selection of statuettes mimics ancient collections, such as the Walters Art Museum group that was found at Boscoreale. The assemblage of figurines in this exhibit contains multiple statuettes of the same deities, which was common to groups of statuettes found together. These small bronze statuettes were mass-produced, and often reproduced the iconography of well-known sculptural types. Photograph of the modern-day lararium structure in the Roman Galleries of the Walters Art Museum, Baltimore, MD, which houses bronze statuettes excavated from the Villa at Boscoreale. Image courtesy of the Walters Art Museum. The statuettes featured in this exhibition illustrate the polytheistic and cross-cultural confluence of ancient Mediterranean religions. The bucranium, bull or ox skull, harkens back to pre historic Mediterranean representations of sacrifice. It also evokes the religious imagery of the Roman Imperial period. The statuette of the Etruscan priest recalls an earlier Italic culture whose rituals and traditions were adopted by the Romans. He bears a leafy crown, a patera (offering dish), and an incense box. The Lares, deities who oversaw good fortune and protection of the Roman household, stand in similar postures, and one Lar carries a patera comparable to that of the Etruscan priest. The Hand of Sabazius, an apotropaic symbol of eastern Mediterranean origins, and the Harpokrates figure, a composite deity of Greek, Egyptian, and Roman influence, exemplify the Romans’ assimilation of foreign religious cults. The Hercules figures reflect a similar integration of the hero into politics and religion of the late Republic and early Imperial periods, when Hercules became more important to Roman domestic space and was incorporated into the foundational mythology of Rome. The presence of Herculean iconography in domestic shrines highlights the tutelary aspects of this multifaceted deity.